We’d love your help. Let us know what’s wrong with this preview of Give Up the Dead by Joe Clifford. To ask other readers questions about Give Up the Dead, please sign up. I received a copy of Give Up the Dead from Netgalley in exchange for an honest review. Give Up the Dead is the third book in the Jay Porter series by Joe Clifford. I am new to this series so I worried I could run into some confusion but Clifford provides enough detail to fill in any blanks. I appreciate authors who take the time to provide some backstory, instead of assuming the reader has read all the books in a series. The writing is solid and characters are well-drawn. I really thought I would I received a copy of Give Up the Dead from Netgalley in exchange for an honest review. Give Up the Dead is the third book in the Jay Porter series by Joe Clifford. I am new to this series so I worried I could run into some confusion but Clifford provides enough detail to fill in any blanks. I appreciate authors who take the time to provide some backstory, instead of assuming the reader has read all the books in a series. The writing is solid and characters are well-drawn. I really thought I would like this one more than I did, however, and the main reason I didn’t was Jay Porter. His unrelenting bad attitude and first person POV made this hard for me to enjoy. There are copious reasons for his constant irritability (his parents and brother are dead, his wife left him and took their son with her, he has a permanent limp from a severe leg injury, etc.) but it started to get on my nerves after awhile. In this outing, Jay quickly finds himself wrapped up in two investigations, whether he wants to be or not. One involves the missing son of a wealthy business man. A stranger appears at Jay’s home with an offer of a large sum of cash to locate the teen. He works for the teen’s father and the father claims the boy was taken against his will by a sketchy rehab facility. Jay wants nothing to do with looking into matters that don’t concern him and sends the man away - but is eventually drawn in. Not long after, Jay gets a phone call from the Sheriff that his boss and friend, Tom Gable, has been attacked and left for dead. The prime suspect is Jay. As Jay reluctantly looks into the missing teen case and urgently tries to find the person who attacked Tom, he is somewhat aided by his alcoholic friend, Charlie, and a sort of friend named Fisher. I actually found Fisher to be the most entertaining of the bunch, conspiracy theories and all. Ol' Joe Clifford just bamboozled me again. I began GIVE UP THE DEAD wondering how on Earth the third novel in a series would manage to surprise me, but it did. It brilliantly did. Clifford's lonely and miserable protagonist returns to investigate a missing teenager in a child custody case he shouldn't be involved with. The case confronts him to his inherent guilt regarding the death of his parents and subsequent death of his brother Chris in the most heartbreaking way possible. There are two char Ol' Joe Clifford just bamboozled me again. There are two characters in this book who get the best out of Jay in their scene: town sheriff Turley, who represent the past and Jay's powerlessness towards his failure and Alison, who represents the future who doesn't quite want because he's too busy trying to piece his past back together. The Turley and Alison scenes make it worth picking up the book alone. Clifford is not wrenching up emotion for the sake of wrenching up emotion here. If you've read the first two novel in the series LAMENTATION and DECEMBER BOYS, these will be some of the most emotionally grueling scenes you'll have read in some time. I read to find books with such lasting power. Another aspect of GIVE UP THE DEAD that was really cool was the mystery. It's ambitious, complicated and eerily subtle. If you're like me and love to compete with authors and solve mysteries before the book's over, this one will give you fits. It's not unfair, but it's a TOOOOUGH one. I really enjoy the one detail that connected the dots together, too! LAMENTATION and DECEMBER BOYS both made my year-end lists when they came out, but GIVE UP THE DEAD is by FAR my favorite one. You MAY need to at least read LAMENTATION before getting into this one, but it is a wonderful, WONDERFUL book. Keeping it fresh and moving while writing a series is tough, but Joe Clifford's got it all figured out. GIVE UP THE DEAD, is a fast moving dark mystery thriller full of twists and turns from the very beginning. Joe Clifford introduces protagonists Jay Porter. Clifford’s main character, Jay Porter, is an abrasive loner who is dealing issues from his past. The author share details of Jay’s backstory including details of his recovery from a serious injury, his messy divorce, and the death of his parents and brother. Clifford builds on Jay’s character allowing him to grow and become a more likable per GIVE UP THE DEAD, is a fast moving dark mystery thriller full of twists and turns from the very beginning. Joe Clifford introduces protagonists Jay Porter. Clifford’s main character, Jay Porter, is an abrasive loner who is dealing issues from his past. The author share details of Jay’s backstory including details of his recovery from a serious injury, his messy divorce, and the death of his parents and brother. Clifford builds on Jay’s character allowing him to grow and become a more likable person. The storyline follows Jay as he deals with an offer to find a missing teenager whose abduction is move than is seems. Readers sit on Jay’s shoulder as he reluctantly accepts the job to get a nest egg that will allow him to purchase his bosses estate liquidation business. The investigation leads Jay to uncover a shady drug rehab program somewhere in New Hampshire wilderness close to the Lamentation Mountains. The storyline increases in intensity and intrigue when Jay’s boss is attached and beaten unconscious, and the sheriff considers Jay the prime suspect. Clifford adds interesting support characters are providing each characters history and the roles they play when they enter the storyline. The author creates subplots changing the storyline direction adding to the suspense and mystery and as each event unfolds Clifford’s readers ending up holding their breath wondering what will happen next. GIVE UP THE DEAD’s momentum never slows down and Jay’s investigation leads him to uncover a dangerous antagonist who adds to a riveting ending setting the stages for Clifford’s next Jay Porter novel a must read. Wonderfully crafted first person prose in a compelling mystery with a stunning ending. I was lucky enough to be able to read an advance copy, so ... you'll just have to trust me on this one. Jay Porter's life keeps getting worse, but Clifford's writing keeps getting better. Go ahead and pre-order. You can thank me later. I received a copy of " Give Up the Dead" free from Goodreads to read and review. I picked up the book from the stack on my shelf because I wanted a book to read while sitting outside in the sun. Reading an e-book on my iPad doesn't work so well in bright sunshine. So I sat down and began this book by an author new to me. Thirteen pages in the book, I found myself flipping back to the flyleaf saying, " Man, what else has this guy written?" Some hours later , I finished the book. Yes, it is that g I received a copy of " Give Up the Dead" free from Goodreads to read and review.
" Give Up the Dead" is a dark, gritty, unsettling and completely absorbing novel. It features one Jay Porter, the consummate loser in life. He's lost his brother to drugs; he's lost his wife because he tried hard to save his brother. He has few friends : one is a hopeless loser drunk and the other is a conspiracy nut who lives in a computer world. Jay has a job though. He works for a antique buyer/ seller driving the truck to estate sales where he loads up the treasure hunter's acquisitions. When he is at home in his apartment over a gas station, Jay sits and broods, drinking beer to keep down his ranging anger. Then one day a man shows up at his place offering Jay a big payday if he helps a nameless client find his wife. On the same day, Jay's boss, the owner of the business , is beaten almost to death. Worse, his wife discovers that the man has designated Jay as the heir to the business. Jay is a suspect.is everything connected? Is anything connected? Is Jay finally losing it? Joe Clifford has a way of making the reader care about Jay, one of life's losers. We learn what has defeated him, what caused so much in his life, why he feels -with good reason- that life is a game rigged against men like him. Mr. Clifford does not spare the reader; he puts all the emotion on the pages to get the reader involved in Jay's downward spiral. It is not pretty, but, wow, it makes for an excellent , dark and thrilling novel.
" Give Up the Dead" earned my recommendation. I will definitely read Joe Clifford's previous work. I suggest you do, too. The first thing I should point out that this is the third book in the Jay Porter series, but the first one I have read. This quickly became obvious as the narrative outlined Jay’s troubled past, referring to a serious injury he had sustained and the loss of his family and thereby explaining his current position. So we are presented with our hero, a hard-working, honest, ethical man, plagued by doubts and pretty much a loner – the good guy, illustrated by his clearing snow from his elderly landlord’s parking lot. Jay gets involved, almost by default, in investigating the abduction of the son of a wealthy businessman, not a kidnapping, but an intervention and then it becomes complicated. I cannot say that I found this to be an exciting, thrilling book. It is well-written and certainly invoked the inhospitable climate of the Lamentation Mountains and I could not but like Jay and his friends. However, this reminded me of the hard-bitten detective novels where the hero is always a loner, always honest, always misunderstood and more importantly, always manipulated by local police, the woman and his past. My description would be ‘more of a slow-burn than fast paced’. Is it worth a read? Yes, but don’t expect to be enthralled if you are looking for a more involved thriller – like ‘Silence of the Lambs’. Joe Clifford is one hell of a writer. I read an advance copy in hardcover and loved it so much I bought it for Kindle too. What I love most about this series (and anybody looking at my GR reading list knows I gravitate to the happy, funny, romantic stuff) is the insanely good writing. Give Up The Dead is not what I usually gravitate to --it's darker, bleaker -- but there's something about Clifford's protagonist Jay Porter that keeps me coming back. Sure, Porter's a screw-up and responsible for m Joe Clifford is one hell of a writer. I read an advance copy in hardcover and loved it so much I bought it for Kindle too. What I love most about this series (and anybody looking at my GR reading list knows I gravitate to the happy, funny, romantic stuff) is the insanely good writing. Give Up The Dead is not what I usually gravitate to --it's darker, bleaker -- but there's something about Clifford's protagonist Jay Porter that keeps me coming back. Sure, Porter's a screw-up and responsible for much of the misery in his own life. But like all of us, he keeps plodding forward. It's when Jay has these very human moments of recognition -- where the light dawns on him, that you hope that Jay will finally find a way to get things back on track, or find a path to redemption. An underdog protagonist who needs a win in his life, badly, is up against dangerous, powerful people to clear himself of murder and find a missing teen, but, its not like he hasn't been in a tough spot before. This latest in the Jay Porter series was reminiscent of old-style hard-boiled detective fiction from decades past and I was pulled in from the start. Give Up the Dead is the third book in the Jay Porter series and takes place about three years after the close of the second book. These books An underdog protagonist who needs a win in his life, badly, is up against dangerous, powerful people to clear himself of murder and find a missing teen, but, its not like he hasn't been in a tough spot before. This latest in the Jay Porter series was reminiscent of old-style hard-boiled detective fiction from decades past and I was pulled in from the start. Give Up the Dead is the third book in the Jay Porter series and takes place about three years after the close of the second book. These books do seem to continue an ongoing story with Jay at the center, but this was my first book from the series and I had no difficulty starting from here since the author caught the reader up on the events in the past. Jay is not a likeable guy in many ways and prefers to be alone and keep his circle of friendship and acquaintance small. He is the ultimate underdog and the sadness and depression pours off him leaving me hoping for a little sunlight in his gray world. He's bitter about the past and how life in general is treating him let alone the specifics of losing everyone he loves including an ex wife who left him with their son in tow letting him only have brief visits and resenting while understanding her choice for the put together businessman type. He suffers from PTSD and anxiety from trauma he experienced from going up against powerful corruption who killed someone he cared about right before his eyes and nearly killed him. He's never gotten past the stigma of having a drug-addicted brother who is rumored to be responsible for their parents' death which was why Jay was suspect number one in the assault situation in this story. He gets kicked around and put down often, but there is something in him that gets back up and keeps going. He cares even though he doesn't want to so it gets him into places that other people won't go. There are two mysteries in the beginning that keep Jay working for answers. It isn't the type of mystery that the culprit is hard to guess, but more along the lines of how to nail the person with solid proof so the law can get involved. This might seem like a downer read and it is in ways especially since Jay is a borderline addict to his drink, cigs, and pain meds, but there is something in the author's writing and the characters he creates that made me cheer things on and engage with the story. Even when the setting of this small, remote town in northern New Hampshire just after Thanksgiving with cold and blizzards is painted, I felt the chill because his language was so vivid. There is a great deal about addiction and recovery in this one and the author writes from a place of knowledge and experience to give it a layer of authenticity. I received a copy of this book from the publisher through NetGalley to read and review. 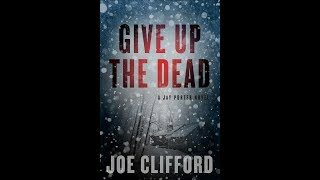 GIVE UP THE DEAD by Joe Clifford is the 3rd book in the "Jay Porter Series", and the first book that I've read by this author. Jay Porter lives in a one room apartment as a divorced father who makes a living working for his friend Tom, somewhat of a father-figure that has a business buying and selling furniture collections to be sold as antiques. Tom plans on eventually selling the business to Jay when he retir I received a copy of this book from the publisher through NetGalley to read and review. Tom plans on eventually selling the business to Jay when he retires, but the 40K required for Jay to buy the business seems out of reach, and Tom's major competition is chomping at the bit to take the business over. A well dressed and mysterious man named Vin shows up at Jay's door one evening in an attempt to get him to look into the disappearance of the son of a rich and powerful man named Crowder. Sensing that there is much more involved than what he's been told, he still decides to take on the case to come up with the capital needed to buy the antique business. Joe Clifford does a great job of presenting Jay as a smart and street-wise albeit cynical individual well suited to persevere in the face of danger, who's not afraid to dig deep into the lives of the rich and famous; as he despises what the privileged can get away with in legal matters. Possibly suffering the effects of PTS from what he's experienced as a result of the loss of his brother, and having previously squared off with a rich family protected by crooked cops, he's left physically and mentally damaged with a dim outlook on life; yet still has the support of his two closest friends, even though he treats them shabbily. I found this book very enjoyable in spite of the bleak picture painted of Jay's life at this point, as the author shows traces of hope in him as he meets a woman involved in the case that awakens long lost feelings of interest, while he searches deeply within himself to evaluate his dealings with those closest to him. As much as this book succeeds on the story involving the investigation, it provides a look into the life of a man who's almost lost hope; yet might be able to recover from loss enough to see the potential for the possibility of love and happiness to be found in the future. Third book in the Jay Porter series and it was another good one. Jay seems to always find some kind of trouble and works his way through it. As always good story, great characters and setting. Easy four star book. Thanks to NetGally for the chance to read it early and will be adding it to my shelves along with Clifford's first two Jay Porter books. Give Up The Dead 💀 is a hard nasty taste of country blues. Jay Porter, the lead character, is perhaps no one's idea of a pulp hero. He is manifestly despondent over his failed marriage, his wife's new marriage, his lack of career prospects, his bachelor life in a sad little apartment, his drug addicted brother's death, his parents' demise, and more. His sad lot is defined by the location - a cold snowy winter in rural New Hampshire in the shadow of Lamentation Mountain. And yet it's an incredibl Give Up The Dead 💀 is a hard nasty taste of country blues. Jay Porter, the lead character, is perhaps no one's idea of a pulp hero. He is manifestly despondent over his failed marriage, his wife's new marriage, his lack of career prospects, his bachelor life in a sad little apartment, his drug addicted brother's death, his parents' demise, and more. His sad lot is defined by the location - a cold snowy winter in rural New Hampshire in the shadow of Lamentation Mountain. And yet it's an incredibly compelling read, most likely because of the narrative voice that comes at you just like a fella talking to you. There are a lot of issues that stew about here from addiction to seduction to murder and the abuse of power. It ends up being a murder mystery, but the story is really about an ordinary guy struggling all alone against the tide of despair as those around him succumb to it. This apparently is the third book in the trilogy, but can easily be read as a standalone novel. It's a really good book that I found really captivating but I am not sure if it will have wide appeal. Give Up the Dead, by Joe Clifford - Copy given by Netgalley in exchange for an honest review. The first thing I have to say is that this is the third book in the Jay Porter series, but the first one I have read. For me this book just kept pulling me more and more to read it, which I always love. Besides, this type of book is one of my favourites, so it was very easy to read it. And the fact the I hadn't previously read the other two didn't make it harder for me to read this one, which I really l Give Up the Dead, by Joe Clifford - Copy given by Netgalley in exchange for an honest review. And the fact the I hadn't previously read the other two didn't make it harder for me to read this one, which I really like. It has sort of a dark vibe to it for sure, but I liked it, a lot, I feel that the darkness makes things more interesting to read. To me this was without a doubt a good book, I liked the characters, I liked the environment and also liked the vibe of it. Overall a great read. "...in the world of investigation, there’s no such thing as coincidence." This is the third book in the Jay Porter series, after LAMENTATION and DECEMBER BOYS. It starts three years after DECEMBER BOYS ended (and if you haven't read the first two books you really should to get the most out of this story). Jay Porter is now divorced and his ex-wife is remarried to the guy she kept claiming was just a "friend" in the last book. His son, Aiden, is now six years old and Jay hates being a weekend fath "...in the world of investigation, there’s no such thing as coincidence." Jay Porter is now divorced and his ex-wife is remarried to the guy she kept claiming was just a "friend" in the last book. His son, Aiden, is now six years old and Jay hates being a weekend father. In fact, Jay hates most everything. He is a dark, miserable man as he has been in the last two books before this. I understand dark and gritty and true-to-life. I lived through a good portion of parts of these books when I was young. I'm an alcoholic and haven't drank or used drugs since 1981. But come on. I would like to see Jay see some light at the end of the tunnel. His son is healthy. His ex-wife lets him see Aiden whenever he wants to. He has a job, a warm place to lay his head at night, enough food to eat. I hope he starts seeing how lucky he REALLY is and gets over his Eeyore complex one of these days. This was another dark, gritty mystery and the storyline was interesting - full of twists and turns. It is well worth reading, as all three books in the series have been. Just don't be expecting sunshine, lollipops and puppies. Give Up the Dead by Joe Clifford is the third book in the Jay Porter Series, although the first one I have read. Jay is pulled unwillingly from the sidelines into investigating the case of a missing teenaged boy. A stranger appears asking Jay to find the boy for his employer for a large sum of money; Jay turns it down, and the next day, his own boss is found beaten near to death with all clues pointing to Jay. In order to clear his name, he finds he must find the lost boy. The more he investigate Give Up the Dead by Joe Clifford is the third book in the Jay Porter Series, although the first one I have read. Jay is pulled unwillingly from the sidelines into investigating the case of a missing teenaged boy. A stranger appears asking Jay to find the boy for his employer for a large sum of money; Jay turns it down, and the next day, his own boss is found beaten near to death with all clues pointing to Jay. In order to clear his name, he finds he must find the lost boy. The more he investigates, the closer the two story lines come together. This is a slow-paced book. Not a lot of action or excitement. Told through Jay's jaded point of view, I found myself reminded of Joe Friday in Dragnet. Just the facts, ma'am, just the facts. A rather dark look at a loner, though lonely man. That being said, the book is well written and held my interest. A good read. Thanks to Oceanview Publishing and Netgalley for providing me a copy of this book in exchange for this honest review. Give Up the Dead, Joe Clifford’s third book in this terrific and excellent written series takes place 3 years from the last book, December Boys. Although in this book, Jay Porter still deals with family issues, they are not as prevalent as the first two books in the series and this book is closer to a traditional crime novel. Porter is back working for Tom Gable buying and selling Thanks to Oceanview Publishing and Netgalley for providing me a copy of this book in exchange for this honest review. Porter is back working for Tom Gable buying and selling furniture and other home items mostly from estate sales. He’s also still recovering from the leg injury he suffered 3 years ago and adjusting to his new life. Soon after helping his boss buy from Thanksgiving Day estate sale in New Hampshire, Porter is visited by Vin Buscoglio, a strange man that asks him to help find a missing teenage boy. Despite the high offer, Porter is not interested. He reconsiders the offer somewhat the next day when Tom talks about getting out of the business and selling to Porter, who feels he’s unlikely to have enough money. Later that night Porter finds out from Sheriff Turley that someone attached Gable and he is severely injured, landing in the hospital in a coma. Jay is the main suspect especially when a note is found willing the business to him in the event of Gable’s death. Porter’s love for Gable and his desire to find the true attacker gives all the incentive he needs to begin his own investigation. Porter also realizes he needs money and he also tries to find Vin Buscoglio and the missing teenage boy. Porter enlists the help of his friends and tries to stay out of the way of Sheriff Turley. Give Up the Dead is another terrific addition to this series. I’ve read them all and each one provides an exceptional story with realistic and interesting characters. Jay Porter is a flawed and emotionally damaged person but he has grown throughout the series and I’m really looking forward to reading more of his adventures. We catch up with Jay Porter 3 years after the events of "December Boys" and once again, Jay finds himself on the wrong end of, well, everything. First he is offered a boatload of cash (from a stranger) to find and retrieve a rich mans son from (maybe) a cult of some sort, and then his boss at the estate clearing company is beaten into a coma and yup, Jay is the prime suspect. As before, you find yourself cheering for Jay even as you cringe over some of his choices. A well constructed plot delive We catch up with Jay Porter 3 years after the events of "December Boys" and once again, Jay finds himself on the wrong end of, well, everything. First he is offered a boatload of cash (from a stranger) to find and retrieve a rich mans son from (maybe) a cult of some sort, and then his boss at the estate clearing company is beaten into a coma and yup, Jay is the prime suspect. As before, you find yourself cheering for Jay even as you cringe over some of his choices. This was kind of difficult to rate. It got off to a great start but a little over half way it sort of goes off the rails for me. The parts about the brother becomes so repetitious that it's annoying. The closer that I got to the end, the harder it was to pick up this book to continue reading. Not my cup of tea. Two and a half stars. Thanks netgalley for another interesting read. Jays life is sort of depressing, boring A last minute auction on Thanksgiving day will change everything for him. He is contacted requesting his help in finding a boy. After the offer is turned down His boss is almost killed, his work place is broken into, inventory stolen he is beaten. What's the connection. What will he do? The ending is hard. But its real life along w Jays cussing. Which I'd why I keep reading thus series. These books are not quaint of precious or happily ever after. They broken people doing their best. People most of us know & love can't wait to read another. Joe rocks!! Reluctant detective Jay Porter is back and as misanthropic as ever in Joe Clifford’s latest novel, Give Up the Dead. That’s good news for anyone who likes their mysteries darker than a cup of three-year-old motor oil, because like Clifford’s earlier efforts (Lamentation and December Boys), this book is bleak – in the best way possible. This ain’t your grandma’s favorite cozy mystery, that’s for sure. It’s been three years since Porter’s last case left his life in shambles, and he appears content Reluctant detective Jay Porter is back and as misanthropic as ever in Joe Clifford’s latest novel, Give Up the Dead. That’s good news for anyone who likes their mysteries darker than a cup of three-year-old motor oil, because like Clifford’s earlier efforts (Lamentation and December Boys), this book is bleak – in the best way possible. This ain’t your grandma’s favorite cozy mystery, that’s for sure. It’s been three years since Porter’s last case left his life in shambles, and he appears content to give up the wannabe detective life for good – until a strange man shows up on his doorstep with an offer almost impossible to refuse: find a missing kid who’s been taken to a shady drug rehab somewhere in the wilderness and haul in a score that could change his life. Unfortunately, nothing’s ever simple for Porter (always at least partially because of his own stubborn obstinance…) – and things only get more complicated when his boss is attacked and left in a coma and Jay is the prime suspect. Now, with his freedom on the line, Porter once again finds himself working a case when he’d rather hole up in his dingy one-room apartment and be pissed at the world. One of the most common criticisms lobbed at the Jay Porter books is that Porter is an unlikeable protagonist. There’s at least a grain of truth to the criticism, because Jay is prickly even by the standards of hard-boiled detective fiction. However, I’d argue that this prickly disposition is what makes Jay so compelling in many ways – his self-destructive tendencies can be aggravating (I like to think of him in the same vein as Californication’s Hank Moody – another deeply flawed character we come to love despite the fact that he’s often his own worst enemy), but it’s also easy to see they’re a defense mechanism. Porter is a damaged character – and that’s never more apparent than in this book. He’s a man on the verge of hitting rock bottom, wracked by guilt over his inability to help his junkie brother, to be a good husband and father, and to fit into the role society has set aside for him. He lashes out at the world in frustration because of it – mostly because he doesn’t feel the world’s punished him enough for his own failings yet. This occasionally makes Jay a tough character to like, but he’s the ultimate underdog – which keeps you rooting for him as he goes up against characters with seemingly insurmountable resources and power. At the very least, Jay Porter is a welcome break from the sea of cookie-cutter protagonists populating modern crime fiction. The character is deeper than he appears to be at first glance. This is, of course, a credit to Clifford as an author. The beauty of Joe Clifford’s work is the way he so competently crafts a well-structured mystery plot, then couples it with prose that sings on the page. Clifford reminds me of Ken Bruen and Joe R. Lansdale in this regard: the writing can be funny, maudlin, and poetic – often all at once -- but it’s always beautiful. Give Up the Dead may be his finest effort to date as far as the quality of the writing is concerned – which is no small feat, since both previous books featured some really striking passages. With Give Up the Dead, Joe Clifford once again proves his work deserves a wider audience. This is a top-notch novel from a writer who’s just hitting his stride. Hop on bandwagon now, so you can tell all your friends you were reading his work before it was the hip thing to do. This is one of those gritty, atmospheric books, where the setting is a vital part of the story. In fact, the setting was probably my favorite aspect. The story takes place in a small mountain community in New Hampshire, right at the start of winter. The author perfectly captures the New England feel with both the area and the characters. I immediately connected with Jay Porter, a man who has been kicked around one too many times and is struggling to get back on his feet. I felt the edge of depres This is one of those gritty, atmospheric books, where the setting is a vital part of the story. In fact, the setting was probably my favorite aspect. The story takes place in a small mountain community in New Hampshire, right at the start of winter. The author perfectly captures the New England feel with both the area and the characters. I immediately connected with Jay Porter, a man who has been kicked around one too many times and is struggling to get back on his feet. I felt the edge of depression creeping in for him. But, as the story progressed, Jay began getting on my nerves. He wallows in self-pity, which he often turns into anger, and he refuses to let go of the past. And, to make matters worse, he's a taker, happy to recruit his friends for help while treating them like crap. The book is written in first person, from Jay's perspective, so all the brooding and disrespect made it difficult for me to stick with him. Addiction and recovery are at the forefront of the plot. I felt the sinking despair of the characters lost to addiction, and the struggle toward and with recovery for others. The case Jay Porter investigates is interesting, if not a little convoluted. We go along as he unravels the details, and there are some good twists. My one problem here came with the cops' involvement (or lack thereof). We only really see one cop doing anything, and that's Jay's nemesis from a previous book. The cop comes off as completely inept. I found myself wondering how he managed to do his job without Jay steering him in the right direction. I also wondered where the other cops were and why certain events weren't being investigated with more concern. Joe Clifford is certainly a gifted author and I enjoyed his writing style. Unfortunately, I'm not sure I liked Jay Porter enough to spend more time with him. This is the first Jay Porter book I've read, and it works well as a stand-alone. A worthy addition to the Jay Porter series. I enjoyed reading this novel in the series, but oh! The ending! Can't give it away. The plot line was complicated and a couple of times I had to go back and check parts of the sequence of events. Who knew that New Hampshire was so dastardly? What I recall about New Hampshire is Polly's Pancake Parlor! As usual, the dialogue is snappy and realistic, and I can almost smell the funky apartments. That said, the only thing I would ask for next time is a case that takes place in the summer or autumn. A I enjoyed reading this novel in the series, but oh! The ending! Can't give it away. The plot line was complicated and a couple of times I had to go back and check parts of the sequence of events. Who knew that New Hampshire was so dastardly? What I recall about New Hampshire is Polly's Pancake Parlor! As usual, the dialogue is snappy and realistic, and I can almost smell the funky apartments. I won a copy of this book through Goodreads Giveaways. Not a normal read for me, but the rating and odds were good so I entered the contest. It was GOOD. Great writing. Kept me engaged. Plan to read more "Jay Porter Novels". Jay finds a death certificate in the pocket of a gift coat and the search for answers begins. Jay's boss and friend is found very badly injured. For a book to be a must read, it needs to have a few things going for it. A good plot, believable dialogue and perhaps most importantly, have characters a reader can relate to in some capacity. To me that doesn’t mean a character you 100% agree with or sympathize with, instead I mean a character that in some manner you ‘get”. Maybe a character who regrets the choices they made that pushed a former lover away or a character who aches for more time with their child. Sometimes it is a character who For a book to be a must read, it needs to have a few things going for it. A good plot, believable dialogue and perhaps most importantly, have characters a reader can relate to in some capacity. To me that doesn’t mean a character you 100% agree with or sympathize with, instead I mean a character that in some manner you ‘get”. Maybe a character who regrets the choices they made that pushed a former lover away or a character who aches for more time with their child. Sometimes it is a character who longs to do something in life that reminds them despite all the poor choices they make thy can find some semblance of salvation. If you find yourself agreeing with my sentiments, then Joe Clifford’s new Jay Porter book, Give Up The Dead, is going to end up on your must read list. Joe Clifford is acquisitions editor for Gutter Books and producer of Lip Service West, a “gritty, real, raw” reading series in Oakland, CA. Joe is the author of several books, including Junkie Love, Lamentation, and December Boys, as well as editor of Trouble in the Heartland: Crime Stories Based on the Songs of Bruce Springsteen. Joe’s writing can be found at www.joeclifford.com.